On this exciting introduction to Mexico, travel from the sprawling capital through local indigenous villages and beautifully preserved colonial towns into the Maya heartlands of the Yucatan Peninsula. Discover the pre-Colombian pyramids of Teotihuacan before journeying to three different Maya sites, culminating in the famous ruins at Chichen Itza. Aside from the rich history, Mexico's natural highlights are not to be missed, and we explore the vast Sumidero Canyon by boat, as well as bathing in the cascading blue waters of the Roberto Barrios falls. Check-in at our hotel in Mexico City. Modern day Mexico City was built on top of the Aztec capital Tenochtitlan by the Spaniards, after their conquest of the city. Today this busy, lively city boasts a wealth of historical buildings, museums and markets. Tomorrow we'll have a day exploring the Teotihuacan pyramids and the downtown area of the city , but there is so much to do in Mexico City that it's well worth considering booking a night here before your tour starts. The Anthropology Museum is a particular highlight worthy of an extra day. On our first day in Mexico City we will drive out to the mysterious pyramids of Teotihuacan. Although abandoned thirteen centuries ago, they are still an unbelievable sight. Once the largest city in the Americas with perhaps 100,000 inhabitants, its influence continued through Middle America, and Maya craftsmen borrowed its decorative motifs and building designs. Centuries later the Aztecs revered Teotihuacan as 'the Place of the Gods'. Returning to the downtown area, we have time for a city tour of the huge Zocalo (main square) area, the cathedral and the National Palace with its murals of the famous Mexican artist Diego Rivera, depicting Mexican Independence. Many of these key sights were build on top of Tenochtitlan, the old Aztec capital. 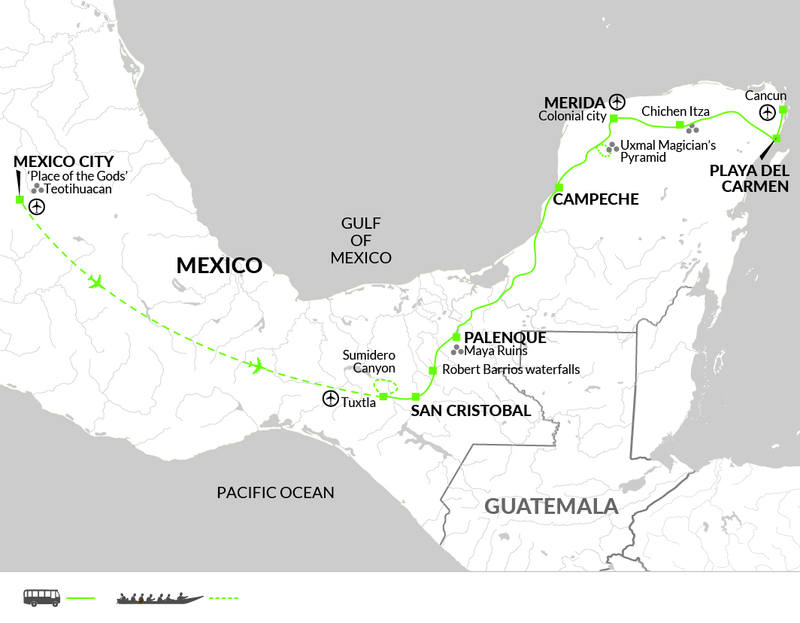 This morning we fly to Tuxtla airport, in the state of Chiapas, and set off for the spectacular Sumidero Canyon, a unique rift 41km long and up to 1000m deep, cut by the Rio Grijalva. This is the spot where, allegedly, in the 16th century, some 1000 Chiapa peoples committed suicide rather than submit to Spanish rule. We take a trip on a speed boat to fully appreciate the towering gorge, before driving up a scenic mountain road to San Cristobal de las Casas, the small colonial and indigenous town located high in the tree-lined Chiapas range. At 2210m above sea level, it can get quite cold at night! Setting out northwest of San Cristobal, we drive to the traditional villages of San Juan Chamula and Zinacantan to discover a completely different side to Mexico. These two villages are strongly indigenous, and practice an interesting blend of Catholicism and traditional Maya beliefs', which is evident from a visit to the local churches. After exploring the villages we head back to San Cristobal for free time to spend wandering around the shops, squares and markets of the small town. Indigenous groups from the surrounding hills fill the town and marketplace with their colourful dress, including the distinctive Tzotzil people who still retain much of their Maya customs and language. They are noted for their bright textiles and weavings in bold designs, and this is the place to barter for some colourful souvenirs. This afternoon you may wish to visit the Na Bolom, the House of the Jaguar, which is dedicated to the preservation of the Lacandon tribe and displays many of their artefacts, or the Kakaw museum where you can learn about the history and production of chocolate in the area. One of the highlights of our trip is today's guided visit to the famous jungle ruins of Palenque, a fascinating and important Maya site. Once the choking forest was cleared, the ruins revealed the tomb of the high priest Pakal, his body adorned with a marvellous jade death mask - one of the most prized relics of the Maya culture, discovered only in 1952. The entire site, shrouded by the steamy rainforest, has an aura of deep mystery. After our visit we continue to the stunningly well-preserved colonial city of Campeche, which we explore on foot. This UNESCO Heritage city was constantly sieged by pirates and is thus the only walled city in Mexico It is almost so well maintained that it feels like a storybook town, and we will wander the walled ramparts, narrow cobblestoned roads, boulevard and pastel coloured buildings this afternoon. Beyond the walls of the old city, there is a bustling coastal town, with frenetic market activity, an inviting waterfront and old fishing docks to walk around. The next stop on our journey is the ancient site of Uxmal. Encircled by hills, Uxmal is expansive in its design with majestic palaces and pyramids. Long geometrical friezes rank among the most splendid examples of ancient American Art. The incredible Pyramid of the Magician and the beautiful Governor's Palace are two of the finest examples of Maya art anywhere. Later in the day we drive to Merida, famed for its beautiful Spanish-Moorish style architecture, where we have time to wander along the narrow streets watching the horse-drawn carriages rattle past. Alternatively there is an option to visit the Mundo Maya Museum, with its interesting displays and artefacts from the Maya culture. This morning we drive to Chichen Itza. Founded in AD432, re-founded in 987 and conquered by the Toltecs in the 10th century, the culture of the Maya and the Toltec gradually fused. The pyramids, palaces, temples and ball court (where death was the penalty for defeat) are adorned with astonishing sculptures. Under the pressure of the civil war, the great monuments deteriorated and the Maya civilisation collapsed. Chichen Itza remains one of the most outstanding sites in the Americas. After a lengthy visit we drive to our final hotel in Playa del Carmen. The trip ends this morning in Playa del Carmen. For those who wish to stay longer, we can arrange post-tour accommodation in Playa del Carmen at our conveniently located hotel, just 1 block from the golden sands of the beach. An umbrella is useful for tropical downpours. A torch and waterbottle are recommended. Bring insect repellent, sunscreen and a sunhat. Accordingly you should allow approx. US$40 for gratuities for local staff. 10% is expected in restaurants. Why not combine your short trip to Mexico with 7 nights in Cuba? 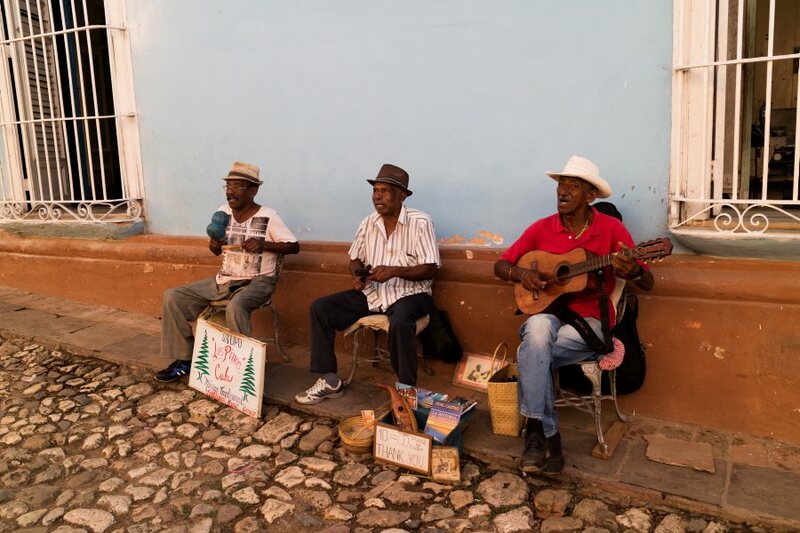 With an easy connecting flight from Cancun to Havana, booked by Explore, it's easy and stress-free to create yourself a two-week trip through two very diverse countries. Click here for more details. We have created this trip for travellers who want to discover the major Mexican highlights but are short of time. Including the archaeological sites of Teotihuacan, Palenque and, of course, Chichen Itza, as well as the natural beauty of the Sumidero Canyon, this nine-day adventure will not disappoint.